Those were the days when i was eagerly looking forward to relocating to Mumbai from Delhi to begin an animation movie with Planman Motion Pictures. We had the script ready and i was in the process of finalizing the business plan for that venture. On one of my many trips there during that period i met a gentleman named Habib Faisal. I had a lengthy conversation with him about many interesting topics mostly about lifestyle differences between Mumbai and Delhi. He seemed a very interesting person and i somehow during the entire conversation never bothered to ask him what he did for a living. Only much later that evening i came to know that he was none other than the script writer for Salaam Namaste and Tara Rum Pum Pum. And he was in the process of finalizing his next script that he was also going to direct for Planman Motion Pictures and that movie is none other than Do Dooni Chaar. Thanks to worldwide recession and cuts in spending the planned animation movie never took off. Meanwhile i got busy with the advertising division of Planman. 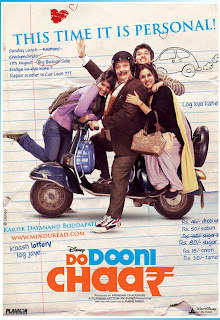 Around the same time shooting for Do Dooni Chaar commenced in Delhi. There was palpable excitement all around the office, I used to get daily updates on where they were shooting that particular day but somehow never managed to make it to the shooting locations. While there was action at the shooting location, there was also a lot of action among my colleagues who were involved in business development. There used to be innumerable phone calls with various brands that were to be involved with the movie. Right from the car showrooms to the Mc Donald's restaurant, etc, every location had to be finalized and deals to be closed. Most often they ended up answering a thousand queries about the script. Finally they did a good job and managed to get the best deals done. In a few weeks the shooting wound up and we forgot about the movie. I got a reply promptly thanking me for the feedback and i was also told that the movie was going to be further edited by a few more minutes to be crisper. I knew that day; we had a winner on our hands. This time there was another SMS stating that Disney had picked up this movie. That was the icing on the cake; it was the first time Disney had ever picked up a live action Hindi film. That spoke volumes about the quality of the movie. The release was still few weeks away in October. Movie releases and gets unanimous appreciation from every single film critic in the country, even Rahul Gandhi watches it, also Sachin Tendulkar on the behest of Vidhu Vinod Chopra and Raju Hirani watches the movie along with his family and friends and is deeply moved by the experience. Not just the conventional media but general talk among people on social networking sites is very effusive in its praise for the movie. I would like to quote a few examples. On the day of the release a person i follow on Twitter who isn’t remotely related to Planman or this movie tweets this to her followers. Another surprising tweet was from the satire website Faking News. They generally don't mince words when it comes to criticizing and making fun of people and have amassed a huge following doing the same. Then i come across this tweet from them as a reply to Prof. Chaudhuri's tweet. @fakingnews What a surprise. I hope you really mean what u said abt Do Dooni Chaar. Also I tend to use Mind u Read Facebook Page and Twitter to get feedback on various topics and when i gave people a choice of 3 topics for my next blog post, there was unanimous support for Do Dooni Chaar, surprisingly the other two topics were Democracy and Enthiran/Robot. Speaks volumes of the impact Do Dooni Chaar has made in the psych of the people. A fourth one i am tempted to share was something that happened yesterday, i was in the lift, going to watch the movie for the first time after its release and there was a gentleman standing next to me speaking on the phone with his friend who was waiting at the ticket counter. The friend wanted to book tickets for another movie, and this person got so furious that he started shouting inside the lift asking his friend to book tickets only for Do Dooni Chaar and nothing else. I was standing next to him and found it very hard to contain my smile. So what is so great about this movie? There are many great reviews of the movie already floating around. I would just like to add my little bit to it. Majority of filmmakers we have grown up watching fall under two categories. The ones who cater to popular tastes and make candy floss entertainers or action packed super hero movies. The other category of film makers are the kinds who make art films in the quest to make timeless classics. We have many examples of both and every other movie that releases falls under either of these categories. Do Dooni Chaar is not just a timeless classic but a timely classic, neither does it attempt to make a superhero out of its hero nor does it glorify the surroundings that he lives in. Instead, it shows us a way to celebrate the extraordinary in the ordinary! Do Dooni Chaar is rooted in reality and everything about the movie has an immediate connect with our surroundings. It hides no blemishes, showcases not just the locations but the actors in their purest forms without any external trappings of showbiz. And at the core of the movie lies a message very relevant to our current day society. If you haven’t already watched this movie, then go watch it. It will be your time and money well spent.